Relaxing, modern and contemporary studio offers guest a relaxing retreat from the busy life in town. Only 5 minutes from Onerahi shopping center, 15 minutes from Whangarei Town Basin. 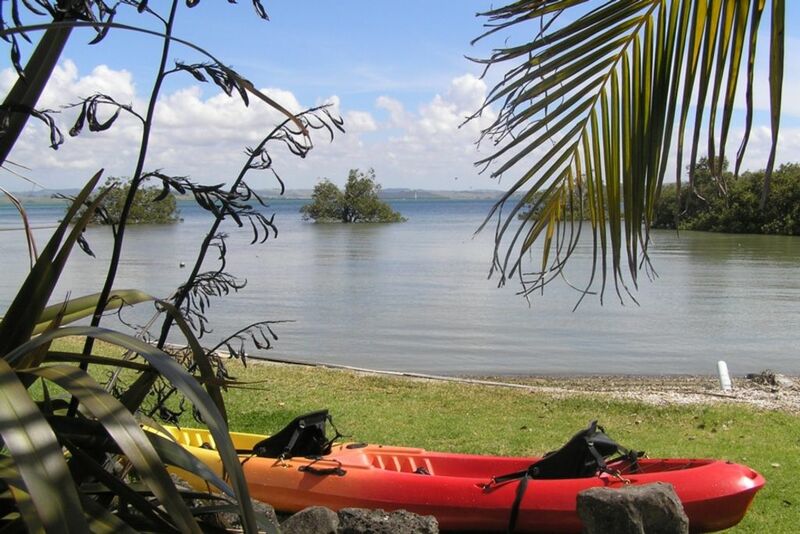 8 minutes from Parua Bay Tavern and Restaurant and 7 minutes to Parua Bay boat ramp.With a Golf course near by, guests have a range of activities close by. For those who want a challenge walk the Mt Mania track and the several bush walks nearby. A range of white sand beaches maximum 35 minutes drive. Watch the sun set at night and sunrise in the morning. Property not suitable for small children as it is on the waters edge. I was born in the North and Theo in Holland. We both have adult children and 8 grandchildren between us. We both love the sea and never tire of the ever changing scene from our property. There is nothing nicer then coming home from a hard days work and sitting looking out at our changing view. We were very lucky when we decided that we wanted to buy a house together. We had always wanted to live on the Whangarei Harbour but be close to work and Whangarei Township and we found our home. A stones throw from the waters edge and yet close to all necessary amenities. Ample parking. Easy access and close to town. A good selection of bird life to watch. Wall heater and stand alone heater supplied. Front loader washing machine in the Studio. Amble parking outside the Studio. All plates and cutlery available. Pots and fry pan supplied. Serving dishes and glasses including wine glasses. Can opener etc. Double Kayak for your use. Bouncy vests, paddles and kayak seats supplied. Absolutely loved the property. Large room with all the amenities one should need. Added touch of a BBQ and kayak's to use! Highly recommended! This was our second stay at Ripples n Tides and hopefully won't be our last. It is such a beautiful spot. The space is extremely well equipped and comfortable. We only saw Theo this time, and he was ever so friendly and helpful. Five stars on everything at this place. What a great location and wonderful hosts. Great location, we ate overlooking the ocean and at night marveled at the stars. Theo was a gracious host who was able to strike the difficult balance between being present and at the same time allowing us our space. Theanks Theo! A pleasure to stay here, wish we had longer. Very well supplied kitchen, large comfortable nicely decorated unit. Many extras--washer, drying rack, large TV, beach towels, cooler, etc.--that make for a special stay. We enjoyed our 2 night stay. The room was very clean, tidy and had everything we needed. The BBQ was easy to use and the outdoor area was lovely. Beautiful sunsets and view out over the harbour. Unfortunately for us the view was mostly mud due to low tides and we were unable to take the kayak out. The only downside was the heat, the room holds the afternoon sun and despite having 2 fans on and the doors wide open we were hot and uncomfortable. An air con unit would have meant we were more comfortable. Overall a great stay. Tranquil setting in a well equipped, modern studio. Enjoyable and relaxing stay in an excellent apartment. Hosts were very friendly and accommodating. Highly recommend.